Proudly presenting a handsome example of Texas Hill Country with a touch of Tuscan. Limestone 48 high with rough stucco above make up the perimeter walls. The perimeter walls are also 2×6 studs for that added value of insulation. Take notice that all Bedrooms have large Walk-in Closets. The children’s Bedrooms open up into a common Play Room. Your Master Bedroom is over sized for that king size Bedroom furniture. The Master Bedroom ceiling boxes up from 10′ to 11′-0 in the center with surround soft cove lighting. The Main Living Area is all open to the Kitchen, over sized Nook and Family Room. The Family Room has a 12′ high ceiling so you can display that twelve point Buck trophy ;). Between the Three Car Garage and the Kitchen there is the Mud Room or what I like to call, Drop Zone. Your Kitchen has a Walk-in Pantry inside the Kitchen. Adjacent to the Dining Room you have your step down Wine Grotto with iron gates opening to the Foyer and area behind the Dining Room. I’m also showing a Groin Ceiling in the Dining Room. Off the Foyer you also have your Study with a 12′ high Splay Ceiling. The Study could also convert into a 5th Bedroom. Outdoor Living is becoming very popular and in this plan you have a huge Covered Patio. If you like, an Outdoor Kitchen can easily be built on the left end of the Patio. The tile roof has a pitch of 6:12. 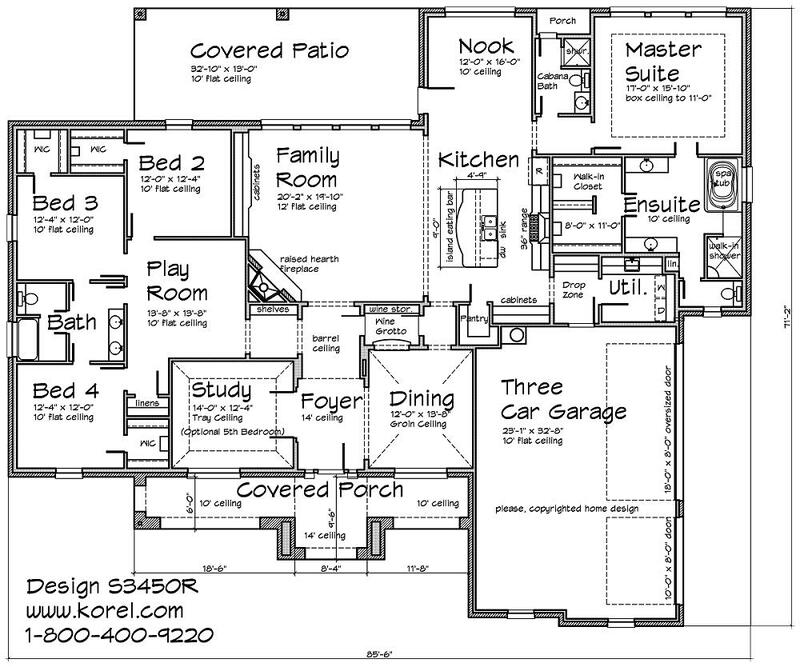 Your Family will enjoy this wonderfully designed home.